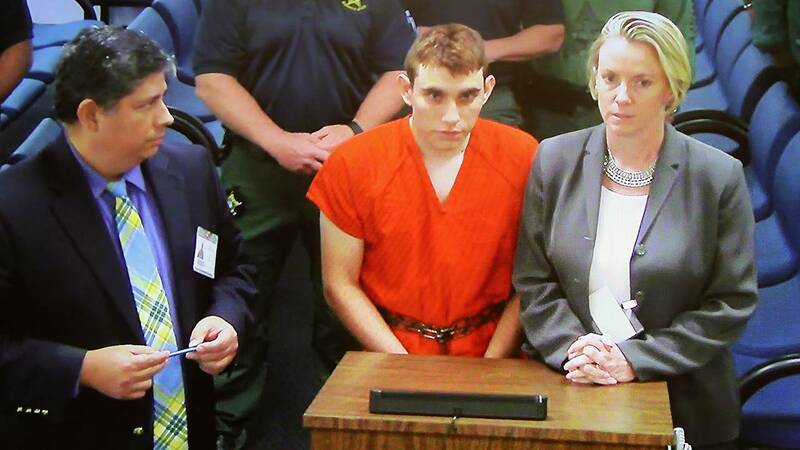 The suspect in the shooting at Marjory Stoneman Douglas High School, Nikolas Cruz, makes a court appearance on a closed-circuit television screen during a bond hearing on Feb. 15, 2018. (CNN) - Exactly three weeks after he stalked the halls of his former high school, shooting and killing students and teachers alike, Nikolas Cruz was indicted on 34 counts of premeditated murder and attempted murder in connection with the rampage that left 17 people dead at Marjory Stoneman Douglas High School. A Broward County grand jury charged the 19-year-old Florida gunman on Wednesday with 17 counts of premeditated murder in the first degree and 17 counts of attempted murder in the first degree. The indictment came as students at the school returned for the first full day of classes since the carnage. Cruz is accused of gunning down students and teachers in various classrooms at the school in Parkland on February 14, in one of the deadliest mass shootings in modern US history. In a span of about 10 minutes, Cruz roamed the halls and targeted people huddled in classrooms on the first and second floors before leaving the campus undetected in a crowd of students. Details of the massacre were shared with the world as students texted goodbyes to loved ones, while others posted social media images and video of chairs overturned in classrooms and blood-stained floors, with rapid gunshots exploding in the background. A public defender described him as a "deeply disturbed, emotionally broken" young man who is coming to grips with the pain he has caused, and said he is willing to plead guilty to avoid the death penalty. Cruz has been held without bond following a brief hearing in a Broward County court last month. The troubled young man appeared by video from jail during his initial court appearance and said nothing except to confirm his name. He nodded when he was told he couldn't post bail. He has been segregated from other inmates in the Broward County jail due to his high-profile status. Counts 1-17 of Wednesday's indictment allege Cruz killed and murdered Luke Hoyer, Martin Duque-Anquiano, Gina Mantalto, Alexander Schachter, Alaina Petty, Alyssa Alhadeff, Nicholas Dworet, Helena Ramsay, Christopher Hixon, Carmen Schentrup, Aaron Feis, Scott Biegel, Meadow Pollack, Cara Loughran, Joaquin Oliver-Padauy, Jaime Guttenberg and Peter Wang. The shooting revived the long debate over gun control in the United States, with some blaming congressional inaction for the massacre and others insisting that it's too soon for such political battles. In Tallahassee, state House representatives on Wednesday debated a bill that would raise the age to buy a firearm from 18 to 21, require a three-day waiting period for most gun purchases and ban the sale or possession of bump-fire stocks. It's known as the "Marjory Stoneman Douglas High School Public Safety Act." Authorities said Cruz's digital footprint offered disturbing glimpses into his mind. He hurled slurs at blacks and Muslims, and according to the Anti-Defamation League, had ties to white supremacists. He said he would shoot people with his AR-15 and singled out police and anti-fascist protesters as deserving of his vengeance. The Broward County Sheriff's Office said deputies were called to the Cruz family home 39 times since 2010.